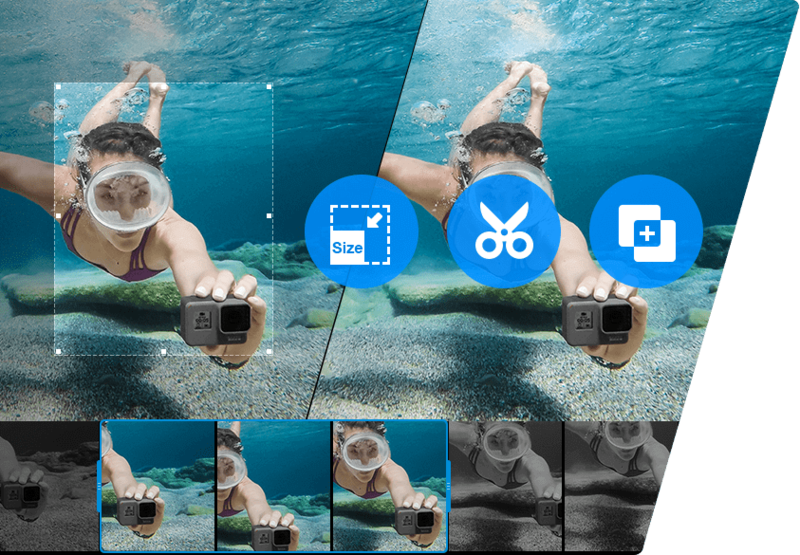 2019 Best Slow Motion Editor | Create Cool Slow Motion Video with Your GoPro, iPhone, Android, DSLR, etc. - Apple allows iPhone 6 to latest Xs Max to shoot 1080p slo-mo video at 120/240 frame per second. 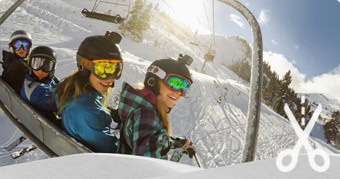 - GoPro action camera series are able to shoot WVGA video at 240 fps, and the latest Hero7 series support 4K 60fps, 1080p 240fps and shots, and firstly introduce slo-mo mode for 2x / 8x slo-mo video shooting. - Sony Xperia XZs and Premiuns are capable of producing super slow motion records at up to 960fps, for playback four times slower. Shooting high-speed video is just a beginning. To make the slow motion effect available anywhere or still want to alter the slow motion level, you just need an easy slow motion editor to make it come true. VideoProc is worth a shot! - Make any normal speed high fps video into a slo-mo one by lowering the playback speed. - With a wide-range (0.1-16x) playback speed control, it can turn a video up to 10x slower. - Enable you to edit slow motion video - deshake, denoise, cut, crop, trim, resize, transcode etc. - Benefiting from full GPU acceleration support, any video processing can be finished at the fastest speed. Phones or camera manufactures put one or several ready-made slow-mo shooting modes here in advance -> videographer choose a certain one to shoot -> enjoyed the video with slow motion effect. The third way owns more steps. Since high fps video usually has large size, it's suggested to process and edit it with software on computer, but not by app on mobile phones. Below we will set making a slow motion video out of GoPro Hero6 Black's 1080p @240fps video with VideoProc for example. You can free download and set it up on your machine, then work the slo-mo video making through once the tutorial is finished. More edits to make slow motion video more attractive. Fixed slow motion speed. More complicated procedure to make a slow motion video out. After downloading and installing VideoProc on your PC or Mac, you are free to go. Here's the rundown of guides and tips for stabilizing different GoPro videos. Shoot normal speed 1080p video at 240fps with GoPro Hero6 Black, and export the large file to the computer, say Windows 10 PC here. Free download and get it started on desktop, click "Video" -> "+ Video" to load source GoPro video into VideoProc. If the source video is born an amazing one, go directly to step 4. If your source video is shaky, noisy or has wide-angle effect, do enhance the quality firstly by using VideoPro's feature-packed toolbox to deshake, denoise, correct fisheye distortion etc. You should export the enhanced video and reload it to software for slow motion making. To transcode the video or not, choose a target video format from the bottom options or from "Target Format" list, and then proceed to "Video & Audio" section by clicking either edit shotcut or "Option (codec)" button located in the video info bar. Different event or moment may require different playback speed, so try to drag the speed slider and preview whether it gets cinematic feel you'd like to achieve. When the value is finally confirmed, click "Done" to remember the operation. VideoProc enables you to apply filter effect into slowed video, tweak brightness/contrast/saturation of it, add external subtitles or watermark, cut/crop, rotate/flip, and change its resolution according to end playback screen. When all settings are done, tap "RUN" to process and place real slow motion video on your PC. No need to do any setting, VideoProc can make use of your hardware acceleration engine powered by Nvidia/Intel/AMD to make video conversion speed faster and CPU usage lower. Expensive High-Speed Slow Motion Camera? Slow Motion Maker Software Is Much Worthier If You're Not a High-end Photographer! For most shutterbugs, the combination of a flagship smartphone, an entry-level DSLR, or an action camera and a pro-grade video editor can meet the needs for all-around life video catching and manufacturing, including bringing forth cool slow motion video to enhance special scenes or show off superpower. No matter who you are, a new videographer, YouTuber or vlogger, VideoProc, with easier-to-operate UI than PR and alike but more powerful features than common entry-level editors, is your go-to-pick for processing award-winning videos.